I have been wearing skirts since recovering from an operation several years ago. I liked them so much I continue to wear them, especially when hiking or driving. I wear them around the house and frequently wear them in public such as shopping centers, restaurants, gas stations, stores. My skirts are as closely resembling shorts as possible and are khaki, denim, camouflage, gray, olive drab. My wife suggested that she iron a crease in front and behind and sew a seam. That way they will look more like wearing shorts. Very few people have noticed what I am wearing and they have all been female. I have only received compliments from them. The added crease / seam makes my skirts look a lot like pants and helps self confidence. Sorry, H-N-S, but I don't wear skirts that closely resemble shorts. I'm sorry but your insistence on them resembling shorts smacks that you are still ashamed of wearing a skirt and are apologetic about it. Look, I'm wearing a skirt but just pretend that they're shorts and we'll all get along fine! Even the title "Stealth Skirt Trick" says it all. That may not be the case but that's how it comes across to me. Wear a skirt like it is a skirt. And don't be fooled into thinking that people don't notice. Perhaps 99% of the time they don't but there are many that do but just don't say anything. I wear a skirt and am unashamed that it looks like a skirt. There's no mistaking it because I wear them in bright colours - blue, red, yellow, whatever. And sometimes well above the knee. I'm wearing a skirt, it's natural for me, I don't care what you think, I'm not ashamed for those around me to know I'm wearing a skirt. The only thorn in the side is MOH, but then life will never be perfect. Most places I will wear a skirt , But there are some that I won't , But I am not going to play a silly game of trying to fool somebody that it is not really a skirt. Calm down, guys, let him do that if he wants! You are both out and proud, but if it helps another man to wear a skirt, then that's just fine. Some people won't notice; some will. Those that notice, well he's broadening their minds, isn't he? And it might end up being a stepping stone to greater confidence and other styles of skirt. HNS, if it works for you, do it! [quote="skirtyscot"]Calm down, guys, let him do that if he wants! You are both out and proud, but if it helps another man to wear a skirt, then that's just fine. Some people won't notice; some will. Those that notice, well he's broadening their minds, isn't he? And no I don't think it is broadening some one's mind . If you are trying to disguise the fact that it is a skirt people will think that there is something wrong with wearing a skirt because you are trying to hide it. Happy-N-Skirts wrote: ... and helps self confidence. If that's what it takes to get out the door, fine. And honestly, if this became the style for men's skirts that actually catch on and go mainstream, awesome! I doubt that, but hey, give the guy some slack. How many on here went years only wearing skirts at home, or sticking exclusively to kilts, or whatever. I investigated the single central pleat as a strategy to start wearing skirts. There are quite a few on the market with this feature. I ended up making my debut pleatless, with just plain denim. If it makes you confident enough to take that first important step then it is well worthwhile because going from single pleat to another style of skirt is not a big step. It could create more scrutiny as people might ponder whether it is or isn't a skirt, whereas if it is obviously a skirt they acknowledge the fact to themselves and carry on with their busy-ness. A nice neutral design sort of looks like shorts yet is a skirt. Sadly the largest size of the Citizens-of-Humanity is a 32 or equal to a women's/misses USA 14. EBay has a lot of these for reference in various designs. Possible that one could buy one of these in a smaller size and fabricate a pattern to enlarge it to fit. Sorry, I started the critique but for a while now he has being going on about how similar his skirt was to shorts and it just struck me as a lack of confidence. Once you've mad the decision to go out in a skirt then, as was mentioned in another thread, it's a bit like parachuting out of a plane, you're committed  and you've just got to take your round spherical objects in hand, metaphorically, hold your head up and project confidence. And he just didn't seem to project that confidence. Sorry, H-N-S that's just the way it appeared to me. I haven't meant to cause offence but others seem to agree. Friends again? denimini, that's a neat trick to cover what would have been the start of the crotch area. Looks good but I agree that it would cause more people to look and wonder if it was shorts or a skirt. Better probably to just go with the skirt, or shorts. In more than one sense! I suppose there is a spectrum of individual preferences as to what our purpose is for wearing skirts. I am not trying to advertise or announce my escape from wearing pants or shorts. My goal is freedom and comfort for walking, hiking, and driving. For those reasons I prefer to blend in as a male who wears comfortable clothes. I like to appear as all of the features of a skirt with the appearance of shorts. Many of the members of this site are afraid to step outside of their house or to venture out into public wearing a skirt. I hope my experiences will help anyone who enjoys the feeling of a skirt without being obvious to most of the public. I don't want to attract attention when I am in a store, gas station, restaurant, etc. It's not a lack of confidence, but rather a personal approach to enjoying my active outdoor lifestyle. Maybe it's my fashion statement and maybe not everyone else's. 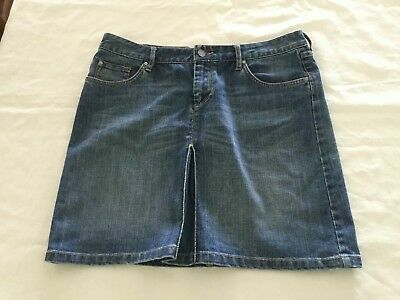 There are a couple threads in the sewing section that touch upon this topic: "Convertible Skirts" and "Converting Jeans to a Skirt". 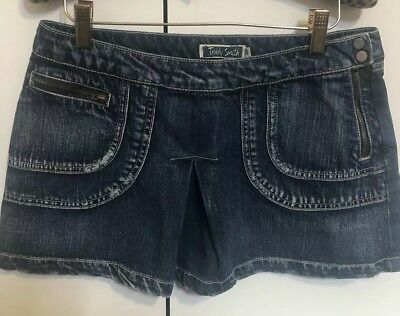 Here is a skirt that looks like shorts. There is no rear pleat though you won't be aware of people talking behind your back. The secret is to find a style of skirt one is comfortable wearing....that is the answer.....Some of my collection do not feel like skirts to me. Yes, the reason I like pleats also is the modesty offered by draping when sitting - also it doesn't limit your stride (not normally a problem with minis). Pleats at the front are good; rear ones get crushed a bit if sitting a lot, like driving. A ruffled hem can be a good compromise as it give the modesty of a bit of drape and extra length on something with the freedom of a micro skirt. weeladdie18 wrote: .....Some of my collection do not feel like skirts to me. You will have to explain that one to me. Last edited by denimini on Sun Mar 03, 2019 10:45 am, edited 1 time in total. Here is another: I had to check out the back view to confirm it was actually a skirt. Although I am not worried about wearing skirts in public now, I would have been tempted to buy this one if it wasn't a bit too small in the waist; just under 12" long and I quite like the fastening detail.